Here at Powder we’re big on colour and being bold with our style! This motto continues at our trade shows, and we like to make sure our displays are as vibrant and bold as our collections. 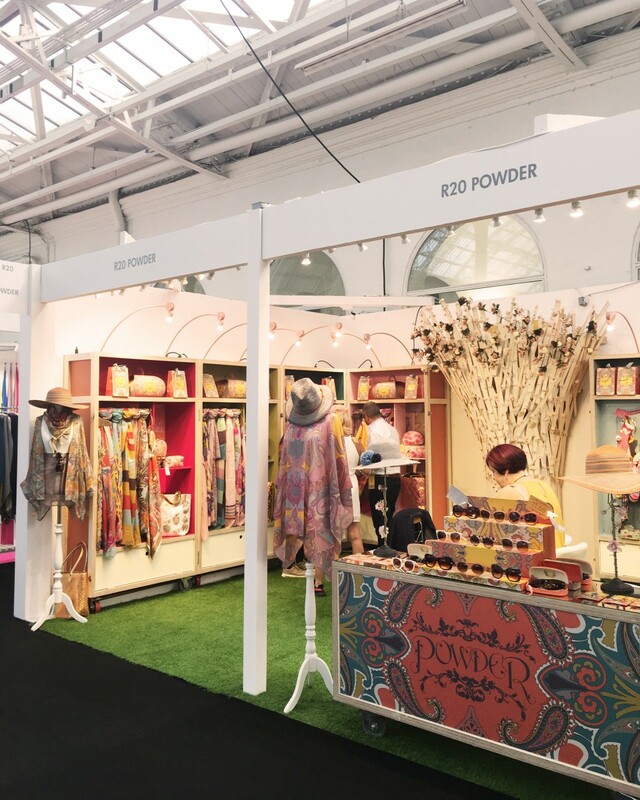 The past few weeks have been busy for the Powder team, and we’ve been travelling around to the likes of Harrogate and London to show off our beautiful new collections. First on our list of trade shows was Harrogate Home and Gift Buyers Show. Here we were showing our Autumn/Winter 2017 collection, the last of the shows exhibiting this collection. As always, we like to have very creative and eye-catching visual display designs in our stand, and this was carried on at Harrogate. 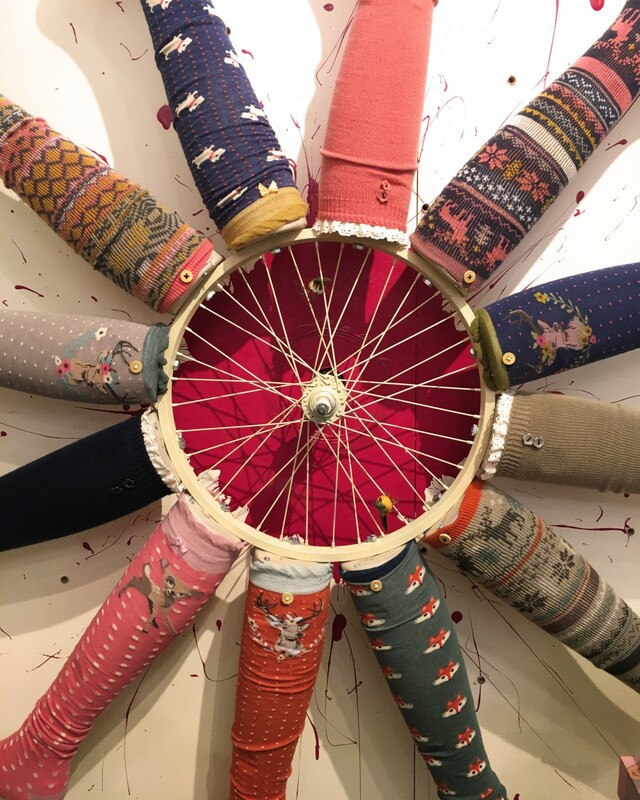 For this show we designed a wall display including a spinning bicycle wheel with mannequin legs attached. Of course the legs were wearing Powder long socks, which made the display even more colourful and striking. Every aspect of our stand was colourful. From the fake grass on the floor, to the multi-coloured display cupboards showing our products. Everyone LOVED our collection, and we’re so excited to have it on our website now to show you all! The final stop on our tour of the trade shows was Pure London. In the magnificent London Olympia exhibition centre, this show was the grandest of them all. Filled with the best fashion accessories, clothing and shoe brands from across the UK and Europe, Pure is a big deal for us and as always we tried our best to stand out against the crowd. Even though this show is only a week after Harrogate, we exhibit a completely new season at Pure, previewing our Spring/Summer 2018 collection. This was exciting for us as it was our first time revealing our new designs, and we couldn’t wait to show everyone! In Pure’s Spring show earlier this year we had a nomination for best accessories display stand, and for this show we were nominated again! It’s safe to say our display designs don’t fail to impress. Our Spring/Summer 2018 collection includes lots of florals, tropical prints, and of course our signature Paisley print. Inspired by our collection themes, we designed a display that was going to not only wow stand visitors, but also allow our collection to really stand out. 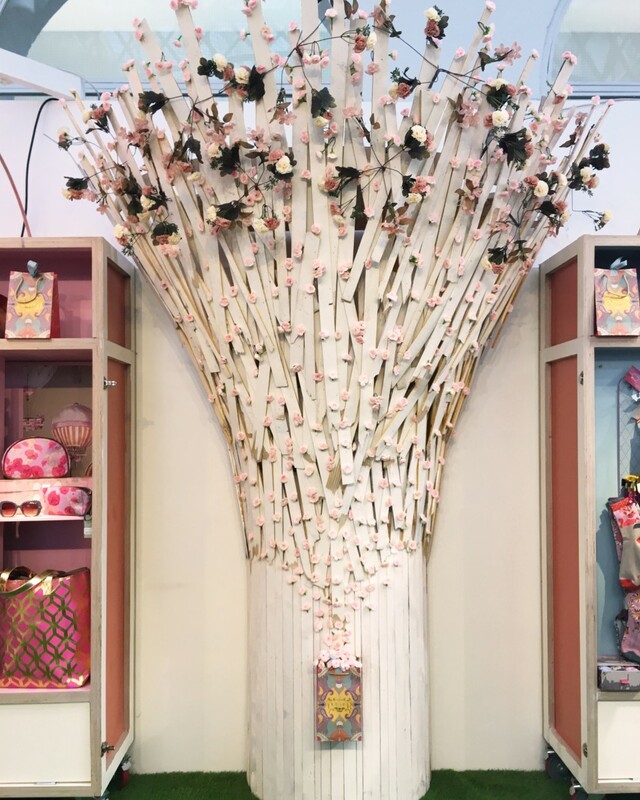 The day before the opening of the show we arrived to set up our stand, and within a few hours we managed to create a tree out of small bits of wood, and some fake flowers. We’re pretty pleased with the outcome! Now the shows are over we’re feeling pretty exhausted, but also excited and happy with the outcome! Make sure to follow our blog and social media pages for current behind the scenes footage of us at the trade shows.